Is it an alligator or a crocodile? If it's a Henry Dupere Garden Sculpture it is a Crocodile. 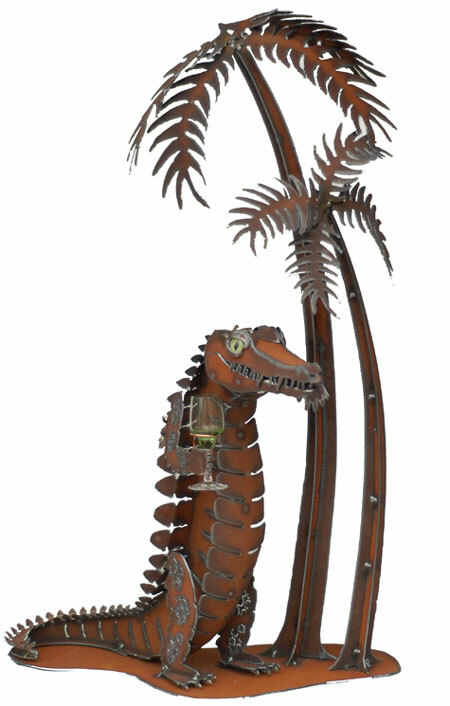 Be it an alligator or a crocodile sculpture this NEW addition to the Dupere collection of sculptures is simply extraordinary & has no equal! And what is the difference between an alligator & a crocodile??? The first difference between a crocodile & an alligator is that they are from different families of crocodilians...the crocodile is from the crocodylidae family, while the alligator is from the alligatoridae family. The easiest way to tell the difference between the two is that a crocodile has a very long, narrow, V-shaped snout, while the alligator has a wider, U-shaped snout & packs more crushing power. Another physical difference is that the crocodile has a lighter brown coloration, while the alligator appears blackish. The alligator also prefers freshwater while the crocodile likes brackish water & sometimes even the ocean. In terms of nesting, the crocodile lays it eggs in mud or sand nests near brackish water, while the alligator makes its nest out of mounds of vegetation surrounding fresh water. South Florida is the only known place in the world where crocodiles & alligators cohabit in the same areas! A full-time artist living in Arizona, Henry Dupere is a skilled & passionate metal sculptor. His imagination, sense of humor, & love of nature are expressed in his unique rusted metal garden sculptures! All of the garden art sculptures in the Dupere collection can be used to add a touch of distinction to any garden or home decor. THE DUPERE ALLIGATOR / CROCODILE GARDEN SCULPTURE WAS SEVERAL YEARS IN THE MAKING, BOTH IN DESIGN & CONSTRUCTION!!! Size" Approx: 32" tall x 20" long x 14" wide. Crocodile / Alligator eyes: realistic taxidermy glass-like eyes featuring superior craftsmanship. Hand-crafted & made with pride in the U.S.A!! !